Riley is a six-year-old Terrier mix who lives in Denver, Colorado. Riley is dog reactive and not always a fan of people he doesn’t know so I flew out to the Mile High city to see if I could help. After evaluating Riley, it was pretty obvious that he was carrying around a lot of anxiety. He was very reactive to unexpected noises, movement and physical touch; recoiling or flinching as soon as they occurred. This is almost a textbook case of a dog who should only be rehabilitated using Positive Reinforcement. Because he is so reactive to other dogs, his guardians had adopted an avoidance strategy as once he saw another dog and got worked up, he was not at all responsive to their commands or corrections. I knew I needed to come up with ways to build up his confidence, help him stop seeing other dogs as a threat and give his guardians some tools to use to redirect him and focus his attention on them when they encountered other dogs. Riley splits time between two homes so I made sure to see and work with him in both settings over the course of the weekend. I always like to start at a dog’s home as this is the easiest setting and the place we need to master completely before we start working on more challenging things like meeting dogs out on walks, etc. Often dogs who are dog reactive do so out of a feeling of possessiveness of their humans. They use aggressive postures or movements to ward off any dogs who they think may want to try to take their humans. The best way to deal with this is to incorporate clear rules, boundaries and limits at home and eliminate any interactions that may confuse the dog into thinking it has more authority than it actually does. His guardians had incorporated some rules such as no furniture, and having to wait for permission to eat which are a good start. But they also allowed him to be within 7 feet of them when eating which is a big no no. One of the guardians was also practicing a leave it exercise while he ate. Because dogs eat in order of their rank, conducting an exercise like this while he was eating can confuse Riley. I also noticed that when they were redirecting Riley such as when someone walked by or came to the door that they often were more specific than what was needed. An example of this was when the mail man arrived. The front door was open so he could see the mail carrier approaching and he started to get worked up. His guardian immediately directed Riley to go to his place (a dog bed) which moved him away from the door. However because the order was for a specific action, this is more in line with a command rather than disagreeing with the behavior itself. I showed the guardian how to use body language and movement to move Riley away from the door and established a boundary of 10 feet from the doorway. I didn’t disagree with his barking or get any more specific than communicating he needed to stay back on his own. Many people hold their dog by the leash or collar and try to physically move him back. I witnessed this technique many times over the course of the weekend. While sometimes you have to do what you have to do when a dog is reacting, I have found that physically restraining a dog always increases their reactions. Taking space and using body language / movement to communicate the dog is to stay back without physically touching the dog required Riley to develop some self control; a skill set this dog needs to develop in spades. To help the guardians stop using physical force to control Riley, I went over a series of Escalating Consequences I developed after years of studying how dogs communicate and interact with one another. Because these communication movements were modeled after how dogs communicate with one another, Riley understood and started responding to them immediately. It will be crucial that the guardians use them in order (sometimes combining them) and initiate them with good timing. Many people are slow or late in their corrections and this can often be the difference between a dog stopping or continuing to get all worked up. As the guardians continue practicing using these consequences their timing and technique will get better until they are responding with them without thinking. I had noticed that Riley invaded their personal space pretty often and suggested that they use the Escalating Consequences to disagree with him when he did so in the future. This way they are inviting him to get close when they decide rather than him taking the space in a dominating sort of way. Next I went over a Leadership Exercise I developed a few years ago to help the guardians practice utilizing the Escalating Consequences. The exercise involves the dog ignoring a high value treat on the floor until given permission to get it. The human only gives permission when the dog shows he is no longer challenging for it. This is different from a standard “Leave it” exercise as this is an operant activity. The dog only gets the treat AFTER it does something first (lay down to communicate he has given up challenging for it). After walking the guardians through the Leadership Exercise, I spent a couple of minutes going over how they can make it more challenging once Riley understands the rules. The Leadership Exercise works best when practiced daily until the dog can get up to 15 minutes or longer of ignoring the treat. If you skip a day while working up to the 15 minute mark, it usually results in a big step back. I was quite pleased at how well Riley picked up on the exercise. He actually covered for his guardians as their timing and technique was a little slow at first. They will need to be sure to keep their hips pointed at the dog no matter where he moves to and step forward with a sudden movement if he gets too close. Now that we had practiced applying the consequences, I wanted to put them to a real world test so I had one of the guardians head out to play the part of an arriving guest so that they could practice claiming the space around the door. By walking directly at Riley to move him back then waiting for him to be stationary before moving backward, his guardian was communicating that she had the situation under control. Since security is usually handled by an authority figure, taking over this job will go a long way toward helping Riley adopt more of a follower’s mindset which will result in a decrease in his stress levels. I told her to ignore the barking and not set a specific location for the dog to go to. All we want Riley to do is stay behind the boundary at this point. Once he sees his guardian has it under control and that security is no longer his job, the barking and pacing will subside. But since I live out of state, it will be important that Riley’s guardian can answer the door without my being there to coach her through it. I handed my camera to the other guardian and headed outside to play the part of a guest so she could do it on her own. Because my phone ran out of memory, the above video got cut off early, but Riley and his guardian both did really well. She did respond a little slow a few times and did let him move around her. Sudden first steps and careful monitoring of the dog is key when doing this exercise. It may help the guardian to put down some painter’s tape so both of them know exactly where the boundary line to the door is. After a week or so of practicing she should be able to pull up this tape and Riley will still know where the boundary is. Riley can pass this line anytime he wants to, EXCEPT when his guardian is answering the door. I suggested that the guardians arrange to have friends drop by to help them practice answering the door this way. And to also call and text one another when on their way so they can practice being a guest when they pick him up. It usually only takes a dog 10-12 repetitions before dogs stop charging the door and start waiting at the border for their guardians to get it instead. The guardians can apply this same technique if Riley is charging a fence, jumping on a window when people pass by or any time he gets over excited while inside or in the yard. As we were wrapping up the discussion of the door answering exercise, I noticed that Riley invaded his guardian’s personal space frequently and also nudged them for attention. While there is nothing wrong with petting a dog, Riley’s interactions were not the most respectful so I suggested that the guardians start claiming their personal space and disagreeing when he started to get too close by utilizing the Escalating Consequences I showed them earlier. Its going to take a few days of consistently correcting Riley for invading their personal space without permission before the humans and dog both get into a new habit. Distance equals respect in the dog world. So helping Riley learn that he needs to sit a foot or two away to ask for attention can be very helpful. To this end I went over a Manding exercise and my Petting with a Purpose strategy. It will take a week or so before the guardians get into a habit of only petting Riley after he earns it by sitting or laying down on command. But once they do, they will essentially be conducting a mini dog obedience training exercise each time they pet him. Best of all, they will do this without even thinking about it. Because dogs spend up to 90% of their time looking for food when in the wild, its a very primally important part of their social culture. Dogs eat in order of their rank so I recommended that the guardians start asking Riley to wait to eat his food until given permission to do so and to only give such permission after they eat in front of him first. If they are going to eat later, they can simply eat a chip, cracker or carrot in five or more bites, then give Riley permission to eat. This will help Riley see them as having more authority and help him gravitate into more of a follower’s mindset. Eating a meal out of these will take up some time, make things more challenging for Riley and also help him feel like he earned his food. Not a substitute for hunting, but a fairly good analog. I use two or three of these per meal with my puppy Quest and switch up the toys for each meal so he gets some variety. Its a challenge which helps with their problem solving skills as well as boosting their self esteem. Assuming the leadership role in the home is the first step and will go a long ways towards helping Riley adopt a follower’s mindset. But its not going to fix his dog reactivity problem on its own. Until the guardians have full control over his behavior in the house (not getting all worked up with guests knocking, mail deliveries or people passing by the window) the next steps wont be as effective. The home is the preferred place to introduce and master any new techniques. Many people mistakenly take their dog into a high stress environment to introduce new things. But this often puts the dog in a position to fail as its too much for them to process. This is why I always start my sessions at the dog’s home. I want to see the dog where it feels the most comfortable to establish a baseline of behavior. I was surprised to learn that the dog trainers the guardians had previously turned to had failed to work with him in his home. I wanted to introduce an attention redirecting exercise in Riley’s home and practice it a few times there before moving to more advanced settings outside if his own home. One of the exercises I wanted to use was documented by my mentor Karen London who wrote a book titled FEISTY FIDO – HELP FOR THE LEASH REACTIVE DOG . Karen’s book shows you how to condition your dog to sit down and look up at the handler when it encounters another dog when on a walk. Karen calls this exercise the Watch. I had been practicing the exercise with Riley at his other guardian’s home and now was ready to spend a few minutes showing the other guardian how to get Riley to look up at her, unprompted. The Watch exercise gives the guardians a tool to redirect their dog, but first you have to wait for the dog to look up at your face voluntarily. It takes some patience at first, but most dogs get it pretty quickly and stop pawing at your hands to demand the treat. Once your dog can do the Watch reliably in your home and back yard amongst distractions, you are ready to start applying it around other dogs. I spent a few minutes going over how to do this with his guardian in the video below. It will be important that Riley’s guardians keep practicing at home amongst distractions while gradually increasing their intensity and repeating the exercise until the dog can Watch on command no matter the distraction. Keep in mind, if a dog is very reactive to the sight of other dogs, the Watch exercise can take longer and require more repetition for each step. To this end, I wanted to change Riley’s perception of other dogs into a positive, as one of the most important parts of his rehabilitation will be helping him stop seeing other dogs as a threat. Many people mistakenly use shock collars, pinch or prong collars when their dog has this problem. But because dogs learn through association, punishing a dog when it reacts to other dogs often makes things worse. The reactive dog interprets the correction as coming from the approaching dog. The best way to help the dog stop fearing other dogs is to build up a positive association to their presence. The technique is called Counter Conditioning. We headed over to a friend of one of Riley’s guardians so I could show him how to use this easy and powerful technique. Unfortunately due to a file error, the video we shot was corrupted. To fully explain Counterconditioning I am sharing a video I shot with a dog aggressive Dalmatian mix in Venice where I go over the technique in detail. After explaining and demonstrating the exercise to his guardian, I handed him Riley’s leash so he could practice doing it by himself. This started out a little off as Riley was so worked up. Whenever you are doing a counter conditioning exercise, its important to start out with your dog calm and at enough of a distance that its not reactive to the other dog. After reviewing the video below, I regretted not increasing the distance between Riley and the other dog when we started. This makes the exercise far more challenging than it needs to be. At first the guardian was holding the treat in ways that caused Riley to move forward. You want to avoid holding it out in front of a dog as this causes them to move forward to get it. In this exercise, the dog needs to stay in a sit. A better way is to only present the treat in front of the dog when it’s seated and looking in the direction of the other dog. You also need to make sure your hand is not obscuring the dog’s view of the other dog. It took a little time, but eventually the guardian got his technique down and started controlling Riley’s position and the direction he was looking. The only other critique I had for him is to not hold the leash with any tension. Both guardians did so at various times, likely due to years of restraining Riley when he was reacting. But tension on the leash can tell a dog the handler is uncomfortable and as a result, it can often intensify the dog’s reaction. Always remember, for a counterconditioning exercise to work, the dog cannot react at all. That’s why we start out at a longer distance so the dog doesn’t feel like the other dog is an immediate threat. You have to repeat this exercise frequently in oder for it to work. The ideal situation is to work with one unknown dog at a time and gradually collapse the distance between them until the reactive dog is calm when very close to the other dog. On our way back to Riley’s house, we ran into a dog out for a walk. We crossed the street to the appropriate distance and I had Riley’s guardian practice this Counter conditioning exercise while looking at the other dog. This is a great example of taking advantage when a situation presents itself. Because Denver is such a dog friendly town, Riley will be encountering many dogs when on walks. In some situations the guardians will need to move away if Riley reacts before they can redirect him. But when they can, practicing the exercise as shown in the above video will go a long way towards helping Riley adopt a new perception of unknown dogs. Riley’s other guardian didn’t have anyone nearby with a dog to practice this exercise with so we headed out to a park where she could practice approaching other dogs (a different variation of the counterconditioning exercise). Riley’s guardian will need to work on her treat hand technique. Riley was only looking in the direction of the other dog half of the time in the above clip. The goal is to have him looking directly at the dog the entire time. Practicing the kneeling, treat-nibbling exercise at home may help the guardian refine her technique. Any time that Riley gets up or paws at her, she needs to bend her elbow away from Riley instantly. After waiting for him to return to a sit with all four on the floor, she can offer the treat again. Once she masters having Riley stay in a sit and can move his head and eyes as she wants at home, she will be much more effective when counterconditioning Riley out and about. By counterconditioning Riley, both when other dogs approach, and when he is the one getting closer to the other dogs, his guardians can work in tandem on helping him practice various approaches. Its going to take a lot of practice sessions, but if the guardians make a point of counterconditioning him several times a week (in 5-15 minute sessions), they should start to see less responsiveness from Riley and eventually be able to be very close to other dogs without any reaction. An exercise called the Reverse or Side Sit is very effective when working with high energy dogs who are dog reactive. I wanted to combine the Reverse Sit with some elements of the Watch exercise so I went over the basics of the Reverse Sit with Riley’s guardian. Now that we had gone over the basics of the Reverse Sit, I was ready to demonstrate it for Riley’s guardian. Because this exercise involves moving fast, its best to do it outdoors unless you have enough indoor space to step back multiple steps repeatedly as shown in the video below. Your form is really important when doing the reverse sit, especially your stance. Standing over a dog can cause them to cower or back away and that works against the principles of this exercise. Treat delivery speed is also very important and is something the guardian was pretty slow with when I had him take a turn at the Reverse Sit exercise. In time, he should try to deliver the treats to Riley within a third of a second of his rear touching the ground. The idea is to get the dog moving too fast to have time to look around and react to a nearby dog. Humans move much slower with dogs which gives them time to look around. This is kind of like when we are driving in slow traffic and try to check an email or text someone on our phone (I do not condone texting when driving). If you are in really thick traffic, thats not something you have time to do. It seems really simple, but as we practiced this exercise, Riley caught on fast and embraced it. When we ran through the exercise with his other guardian the next day, Riley was looking very good. I was so impressed with Riley’s progress (he picked it up faster than any other dog I have taught it to) I suggested we head out to a local park to try it when other dogs were present. This got me a couple of “are you crazy Codr” looks from both guardians, but they were willing to give it a shot. I really can’t communicate how impressed I was with both Riley and his guardian when they practiced the Reverse Sit with other dogs nearby. You may notice that the guardian repeatedly grabbed Riley’s leash and on a few occasions tried to pull him into position. But a dog will always pull against a tense leash. This is likely a result of years of pulling Riley back when they reacted to him once he got going. One of my goals was to teach them what to look for and give them tools to redirect him without using physical force. I always want the dog to do the work. That way, you are teaching them instead of forcing them into something. Now we were progressing through the steps faster than I would like his guardians to do when they are alone. Because Im an expert and was with them, it was ok to move to this more advanced step the day we shot the video. Ideally the guardians should practice the Reverse and side Sit in their back yards and on walks without other dogs nearby for a week or so before trying this again in a park with dogs (The dogs need to be far enough away that Riley doesn’t react to the sight of them). After the first guardian finished practicing the Reverse Sit, Riley was ready to run through it again with his other guardian. It was AWESOME to see Riley following along with both of them while watching their faces instead of becoming distracted and targeting the other nearby dogs. I LOVE how quickly dogs can change once we start communicating what we want in a way they understand and give them the tools they need. Whew. This is the longest write up I have ever done, lol. But Im delighted that Riley’s guardian let me come out to help him with his dog. Without the anxiety, Riley is a great dog who is fun to be around. Its going to take some time and effort by his guardians to help Riley learn to stop seeing other dogs or people as a threat. But after spending a few days with him, Im certain he is not a lost cause. Riley can learn to not be dog reactive. Because his guardians are so dedicated to helping him, I knew showing them what he was capable of while they held the leash was imperative. I have worked with many clients who said that a dog trainer was able to get their dog to behave, but once they left, the dog reverted. But in this case, the guardians were doing the work and reaping the rewards. Stopping dog aggression is challenging, but extremely rewarding. I can only imagine how his guardians have felt over the years not being able to get him to relax and control himself. But building up his self control will be one of the bonus side effects of lowering his stress and anxiety. Now the guardian’s anxiety is a factor, impacting Riley and his behavior. 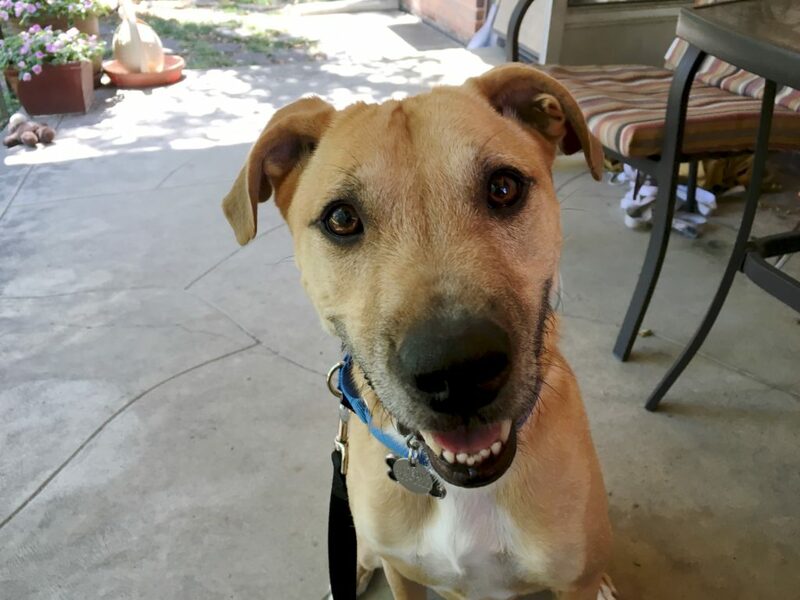 But now that they have the tools to redirect him, boost his confidence / self esteem and help him develop a positive association with unknown people and dogs, they can help Riley learn to become a calm and balanced dogs around other canines.